Crystals give certain cheeses that distinctive crunch. Often mistaken for mold, calcium lactate crystals and tyrosine crystals are the main types of cheese crystals. A crystal is an object that has a crystalline structure throughout. A crystalline structure is a highly-ordered arrangement of atoms/molecules/etc. Sometimes when we say crystal, we mean a true crystal (e.g. table salt) and sometimes we mean a polycrystal (e.g. ice and most other crystalline substances). A true crystal has a continuous crystalline structure throughout. 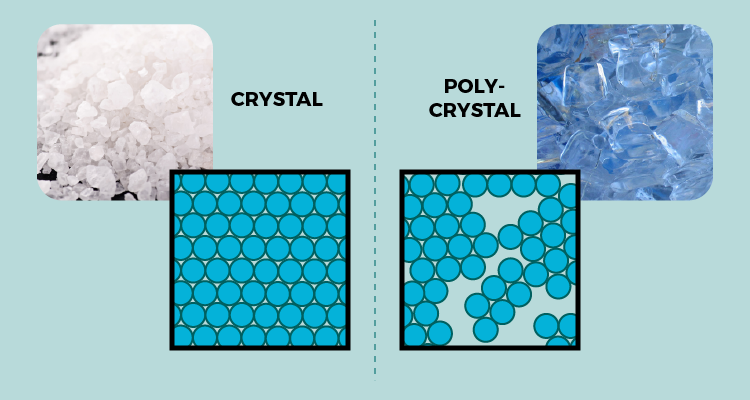 A polycrystal is made up of multiple crystals. Both can be found in cheese, but for brevity’s sake, we’ll use the term “crystal” to refer to both types. The chemistry of crystallization is really complex. A simple way of thinking about it is imagining shaking a box of Legos. If there are a few Legos in a box and you shake the bejeebers out of it, there is a very slim chance you’ll open the box to find some of the Lego bricks stuck together. Increasing the number of Legos in the box increases the likelihood that bricks will start to stick together. A box chock-full of Legos will probably yield at least several stuck together bricks with enough shaking. Let’s apply our analogy. Instead of Legos we’ll use molecules of a substance and the box will be our solution. Add enough molecules of a substance to a solution, there is greater chance the molecules will begin to “stick together” and crystallize. In cheese, our Lego bricks are usually molecules like calcium lactate, tyrosine, or other amino acids (see the next sections). I skipped over a lot about crystallization dynamics, but Wikipedia has a decent overview. The crystal smear often found on aged cheddar cheeses is due to calcium lactate crystals. These crystals are the calcium salt of lactic acid. As cheese ages, the culture breaks down the lactose in the cheese and produces lactic acid. As lactic acid levels rise in the cheese they can begin to bind with calcium ions forming calcium lactate. As the calcium lactate levels rise they will eventually reach a point where they crystallize and become visible to us as the crystals. These crystals can form on the surface of cheeses where moisture can collect. That moisture is the perfect box to shake those calcium lactate molecules around in. Loose-fitting packaging and temperature abuse can encourage moisture to form on the surface of the cheese leading to increased prescence of crystals. Looking at the picture above, you can see most of time calcium lactate crystals appear as a smear across the surface of the cheese. They have a powdery look and feel to them and don’t occur in distinct specks. They occur predominately on the surface of cheese, but can be found throughout the interior as well. They will occur along edges of the plastic touching the cheese and also on any uneven surfaces on the exterior of the cheeses. Their presence usually indicates a well-aged piece of cheese that will have a strong robust flavor. Saying “calcium lactate” around consumers usually makes them frightened. The crystals found in many aged Italian, Dutch, and Swiss-style cheeses are tyrosine. Tyrosine is an amino acid (i.e. building block of proteins). Unlike calcium lactate which we attribute to intrinsic factors in cheese, tyrosine crystals seem to be linked to the activity of the culture Lactobacillus helveticus. This microbe is usually added to the aforementioned cheeses to encourage flavor formation. L. helveticus has a knack for breaking down peptides (i.e. protein chains) into free amino acids, tyrosine being one of them. As the tyrosine builds up it will eventually crystallize out. It's still not fully understood though. Tyrosine can be found on cut surfaces of cheeses, and most famously in eyes of certain cheeses. They usually occur in distinct specks that are dense and have a loud crunch when chewed between the molars. As with the calcium lactate crystals, they don’t have any real flavor to them. They fall under the catch-all term of “flavor crystals” for the same reasons as stated above. These are not as well understood as calcium lactate and aren’t as influenced by how the cheese is treated. I’ll briefly mention the presence of another amino acid crystal that can be found on many of the same cheeses as tyrosine, leucine. Leucine often looks similar to calcium lactate. A google search will yield some research, but more needs to be done. Many things can influence the presence and growth of crystals in cheese. How the cheese is made and the ingredients the cheesemaker used can have tremendous effects on crystals. 1-page summary of the information contained in this post, written in simple language.